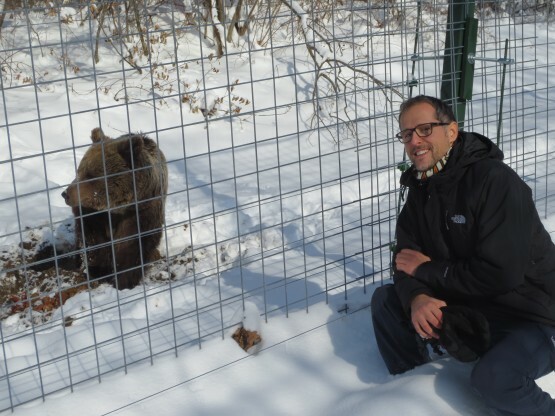 Razvan has run our Romania programmes since 2003, helping to set up and launch the childcare programme in early 2004 and the brown bear sanctuary in 2007. Razvan is a dedicated rep going above and beyond his job description. Not only does he help support the volunteers but he also organises wonderful trips (to Dracula’s castle and the Black Sea among others) while personally getting involved in the fundraising and awareness for the bear sanctuary (he has even been known to dress up as a brown bear on occasion)! Razvan is a highly valued rep who always ensures volunteers have a happy and productive time in Romania! My role as a representative is to support, guide and assist volunteers in every possible way in order for them to have a fantastic time and a great experience. Many highlights, but I will just enumerate a few of them! Meeting new people, working and spending time getting to know the volunteers, socializing and organizing trips around Europe and Romania…these are just a few highlights of my activity! All together, really being proud of the quality of the programmes that Oyster provides and the people I work with. Q4 Why should people volunteer with bears? Working with brown bears, preparing their food, monitor bears activity, helping with the tours and trying to educate tourists and raise awareness on animal rights and just take advantage of the fact that you are surrounded by bears in a magnificent place in the Carpathian Mountains…there’s no way you can be immune to all of this! Q5 Why should people volunteer with kids? Oyster provides a wide range of childcare and medical projects in Romania from working in a children’s hospital, working with children with disabilities in orphanages and family homes and working in primary and secondary schools teaching English. Working with children is challenging but extremely rewarding. It’s fantastic to see children offering affection without asking anything in return. It’s a great opportunity to help, care and offer love for the most unprivileged children but also good if you want to learn some Romanian and generally have fun with the kids. Q6 What changes do you see in the Oyster participants during their time in Romania? It’s amazing to see how people get involved, get passionate and purely transform. They become more confident, increase their self-esteem and knowledge. I can easily say that I’ve seen volunteers much more confident with themselves and the others and I’ve seen people deciding their future studies and careers after volunteering in Romania. I can confirm that volunteering in Romania can change your mentality and the way you see the world forever. To find out more about our childcare, bear sanctuary and medical programmes visit our web pages or contact Anne the destination manager on +44 (0) 1892 771975 or by email: [email protected].